Rumours of a sequel to Matt Damon poker drama were doing the rounds for years, but appear to have come to nothing. Since the Weinsteins produced the film, and they will sequelise anything (quality be damned), I think we dodged a bullet. They even have/had a Shakespeare in Love sequel on the cards. A well-conceived games/sports movie ought not to require the viewer to have a firm grasp of its rules, in my opinion. As long as the gameplay follows narrative rhythms it should be accessible to all. At least, that’s my experience and I’m most certainly not a poker player. 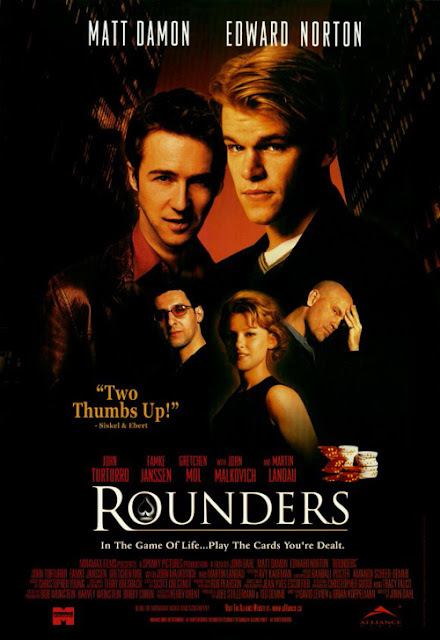 Rounders definitely works on that level, aided by a confidential Damon narration; unfortunately it’s also all-but-submerged under its own surfeit of clichés. However, with a cast this good, the results are never less than watchable. This came out in the same year Damon took home an Oscar for his Good Will Hunting script. The Weinsteins were keen to groom their Matts and Bens at the time, and one wonders if Damon’s blonde highlights weren’t attempt to give him a more traditional leading man appeal. He’s playing a standard Damon type here; a good-natured and earnest law student who is pulled back into the world of gambling when his weasely best friend (Edward Norton) is released from prison. Norton was also riding high from a Best Supporting Actor nomination for Primal Fear a year earlier. He’s as good as always, but his character is so tiresomely familiar that it just goes to reinforce how predictable the whole piece is. The supporting cast features an array of fine thesps wearing two-dimensional (at best) characters; John Malkovich chews the scenery as Russian mobster Teddy KGB, John Turturro is the long game-minded steady player, Gretchen Mol (nice to see her profile rise again with Boardwalk Empire) the nagging girlfriend and Martin Landau the kindly mentor. Landau’s part is easily the silliest, requiring him to launch into a rambling anecdote about his Jewish upbringing every time Matt pays a call. You’re put in mind of a long-winded comedy relative from a Woody Allen movie. Even Famke Janssen appears in a small role; either the ensemble thought the script was better on paper or Harvey did a lot of sweet-talking. John Dahl directs with the kind of new-noir confidence he’s made his signature style, but this is definitely one of his more minor works. His refreshingly retro earlier thrillers (Red Rock West, The Last Seduction) petered out into more standard genre stylings as his career continued (this and Joy Ride). He hasn’t directed a movie since 2007’s You Kill Me, which is a shame. But it’s at least a small consolation that he’s been working on some of the best TV shows around right now (Californication, Justified, Dexter, Breaking Bad).